Implementation of evidence-based programs and practices is a topic that has received increased attention recently — and rightly so as more laws, grants, and other policies are beginning to be adopted with evidence requirements. What does it take to implement (i.e., successfully replicate or scale) an evidence-based policy or program? As more organizations have begun to explore the topic, we are beginning to find out. Thus far, however, a related topic seems to be largely missing from the conversation — politics. Politics is centrally important to implementation for at least two reasons. First, it creates the legal authority, funding, and other capacities that are needed to implement a program effectively. Second, politics does not stop when a law has been enacted. It continues throughout the implementation process. So what do we know about implementation? A good starting point would be any of the following frameworks or activities, all of which are focused on implementation in an evidence-based environment. Implementation Science: Implementation science is “the study of factors that influence the full and effective use of innovations in practice,” according to one of the organizations most associated with it, the National Implementation Research Network. Components of this framework include “implementation drivers” like leadership, organizational capacity, and staff competency. Evidence-based Continuous Improvement: This model, advanced by MDRC, suggests that implementation should be viewed as a cycle of rigorous evaluation, implementation, and adaptation. It is somewhat similar to the Plan-Do-Study-Act cycle of continuous improvement pioneered by William Deming, but adapted to evidence-based policy. MDRC has also recently launched an Implementation Research Incubator, which has already done much work on the subject. W.T. Grant Foundation: While it has not put forth a formal framework, the W.T. Grant Foundation has funded significant research on evidence uptake, mostly notably in education and child welfare. U.S. Department of Education: Similar work is being funded by the U.S Department of Education through the Center for Research Use in Education and the National Center for Research in Policy and Practice. These frameworks and activities are already contributing enormously to our understanding of how evidence-based practices are implemented in the real world. Still, one topic seems to have been downplayed in this body of work. What role does politics play in implementation? There has been some research on the role of politics and evidence in policymaking more broadly. The (perhaps unsurprising) conclusion is that evidence only marginally affects such politics-centric decisions. This conclusion mirrors that of a similar look at the Pew-MacArthur Results First Initiative and its efforts to help states become more evidence-focused. But those conclusions are about politics and policymaking. 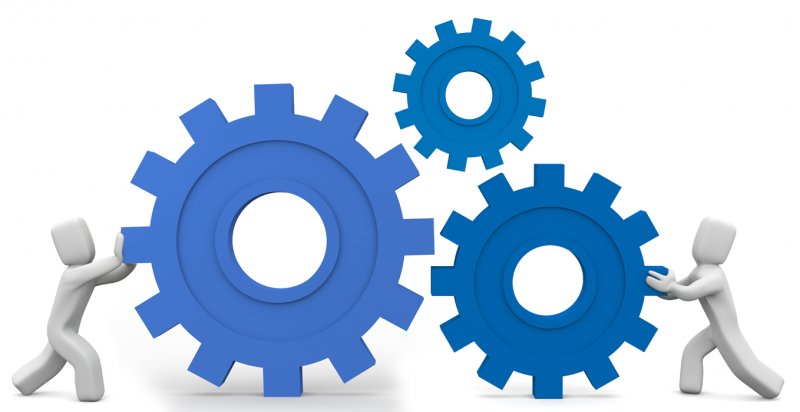 How do politics and implementation interact? As it turns out, politics and implementation are tightly intertwined. Politics plays a central role in the policymaking process overall — and implementation, as part of that broader process, is no exception. 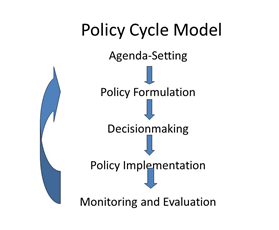 One framework put forward by James Anderson envisions policymaking as a cyclical process that includes agenda setting, policy formulation, decision-making, implementation, monitoring, and evaluation, followed by a repeat of these steps as new policies are considered. Why is this framework important? First, politics shapes the policies that are being implemented. As Patrick McCarthy, president of the Annie E. Casey Foundation, wrote in the Stanford Social Innovation Review, “the road to scale inevitably will run through public systems.” Those systems are shaped by politics. The “iron triangle” of political connections between government agencies, supportive constituencies, and legislators, particularly those that control budgetary purse strings. Bureaucratic politics among various actors within the executive branch. Intergovernmental politics, which is especially important in our federal system because policies are frequently adopted at one level of government and implemented at another. Policy diffusion from one state or local jurisdiction to another, as programs are “scaled” through the dissemination of policy ideas across state lines. In short, implementation is not immune to politics, it is driven by it. 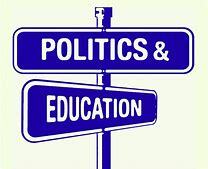 Politics chooses our elected officials, influences the adoption of evidence-based policies, creates the capacity and infrastructure needed to implement them effectively, and influences the choice of high-ranking appointees who oversee their implementation. Policies that lack buy-in from those who are tasked with overseeing them will usually be poorly implemented. Even indifference can be fatal, since change always faces an uphill fight when it confronts the status quo. Top-down Change: Under this pathway, a federal, state, or local government will adopt policies (legislation, budgets, regulations) to induce policy changes by lower levels of government and practice changes by frontline nonprofits and government agencies. Provider-based Change: Another pathway is more indirect. Under this approach, governments (and sometimes philanthropic organizations) will provide funding to evidence-based providers to work with local governments and nonprofits on a voluntary basis. Examples of this strategy in action include the scaling efforts that took place in the Social Innovation Fund and i3 program. Bottom-up Change: Under this pathway, high-capacity local governments or nonprofits will either proactively seek out and adopt existing evidence-based interventions or create new ones on their own. At least with respect to education, research suggests that local schools and school districts are favorably disposed to evidence, so this pathway seems promising. However, successful use of this approach also seems to be relatively rare — probably owing to a lack of sufficient knowledge, leadership, and capacity among most local governments and nonprofits. The rare exceptions are nevertheless important. They include the very innovators that create the evidence-based programs and practices that others will later adopt. To do this, they commonly rely on assistance from governmental and philanthropic grants for the necessary resources. All three of these pathways are influenced by politics and public policy. This includes the bottom-up pathway, since such work commonly relies on public funding. Persuasion-based Drivers (soft): The softest drivers are persuasion-based. They work to convince important implementation actors to support an evidence-base policy. Examples include traditional dissemination activities, technical assistance, education, training, needs assessments, planning activities, and relationship-building. Incentive-based Drivers (medium): Incentives can induce actors to support an evidence-base policy. Examples include competitive grants, formula grants, contracts, and tax incentives. They could include market-based incentives like private or public school choice, performance-based contracts, or pay for success. They could also include public reporting initiatives like public report cards or rating systems. Authority-based Drivers (hard): Authority-based drivers drive compliance through legal or managerial means. Examples include laws, regulations, and managerial oversight. Very large grants in aid, which cannot be easily rejected, also frequently cross the line from being incentives to being compliance-based. Coercion-based Drivers (harder): Coercion-based drivers can induce change through the implied or explicit threat of negative consequences. Whereas incentives are the “carrots,” these are the proverbial “sticks.” Examples could include accountability frameworks, which may tie poor performance to negative consequences. They could also include the threat of audits, fines, or other penalties for poor performance. They could also be political, rather than policy-based. Examples might include governmental agencies limiting their actions for fear of political repercussions from high-level policymakers, or policymakers limiting their choices for fear of backlash from voters or interest groups. Replacement-based Drivers (hardest): Replacement-based drivers are the strongest form of policy driver. They involve the power to fire or replace an individual or eliminate or replace a whole organization. Examples include personnel changes, budget reductions, and organizational closures, takeovers, reorganizations, or re-competitions of contracts. So how do these policy drivers and evidence pathways work in practice? One example can be found in the current implementation of ESSA, the K-12 education law that replaced No Child Left Behind (NCLB). ESSA includes significant new evidence requirements, which states are currently in the midst of rolling out. One important focus of the new law is Title I funding for low-performing, low-income schools. These schools have been subjected to all five of the policy drivers at one point or another since the Elementary and Secondary Education Act was first adopted by Congress in 1965, but especially under NCLB and the School Improvement Grant (SIG) program. ESSA is continuing the focus on these schools. They are a central focus of state planning processes, which are currently underway. These state ESSA plans have been closely tracked by Results for America, whose work so far suggests that there has been substantial variation in their support for evidence. Nevertheless, even a quick review of the plans shows the policy drivers in action. They include relatively low-pressure persuasion-based policy drivers like needs assessments and technical assistance, mid-level incentive-based drivers like grants in aid, and harder authority or coercion-based drivers like accountability frameworks. Local planning efforts will probably also utilize variations of these same policy drivers. While this process, and all of the policy drivers described earlier, are top-down, the on-the-ground reality is that politics continues to play a dominant role — and it runs both ways. Bottom-up political influence acts as a countervailing force that can (and does) effectively limit the use of the various top-down policy drivers. These political mechanisms were powerful enough to drive Congress to replace NCLB with ESSA. They played a role in the related Common Core standards efforts. They probably also greatly explain the variation now seen in the state ESSA plans, probably because of varying partisan and ideological leanings among the governors, state legislatures, and other players. These political differences also largely explain state variations in legal authorities, budgets, personnel, and other pre-existing state and local capacities that are needed for implementation. Implementation of evidence-based programs and practices — at least for public programs involving health, education, and social services — is inherently intertwined with politics. Implementation involves much more than narrow technical issues like fidelity, capacity building, continuous improvement cycles, and evaluation. While each of these issues is vitally important, they are nevertheless part of, and fundamentally driven by, a much larger public policy cycle that is inherently political. Politics should be an integral part of any implementation model. A better understanding of the role of politics will be critical to implementing evidence-based policies effectively. This entry was posted in Implementation, Politics. Bookmark the permalink.